This digitisation project is about creating a free, open-source web publishing platform for displaying the research content of a specific conservation plan. The plan relates to the town of Hermoupolis in Syros (Aegean Sea), which is some 200 years old, and unique to the extent that its building stock of more than 1000 buildings has remained intact, almost as a whole, from its foundation to the present day. A multi-variable model has been developed for the assessment and monitoring of nearly all these buildings, recording data up to 192 fields in each building, creating multiple dimensions for extracting, and then understanding and interpreting, a building’s history, location, condition, present and past purpose, ownership, pathology and architectural quality. Each building’s vulnerability to deterioration or even collapse is also thus recorded and the detail is publicly accessible. HERMES is a specific multi-criteria conservation plan for the city of Hermoupolis, already applied by the local Municipality. In the current situation of economic difficulty in Greece, such an extensive and detailed record is extremely valuable in assessing priorities for intervention when resources are limited. The scientific and technical sophistication of this project commended it strongly to the Jury. The relatively short history of Hermoupolis does not make its architectural value less significant, and has enabled an amazingly detailed and accurate set of data to be compiled. 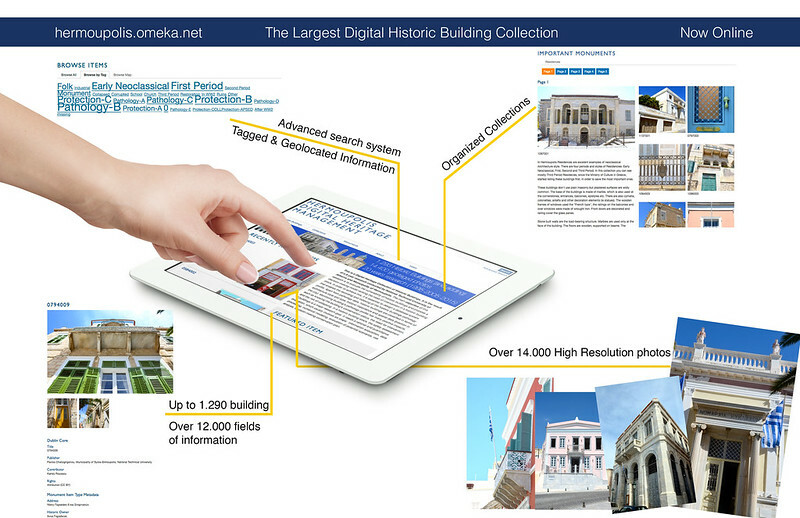 The project is a model to promulgate the value of digitisation in the collection and maintenance of intelligence about Europe’s architectural heritage, and ways in which our understanding of the complexity of the past and our response to it in future can be developed and become a basis for action.